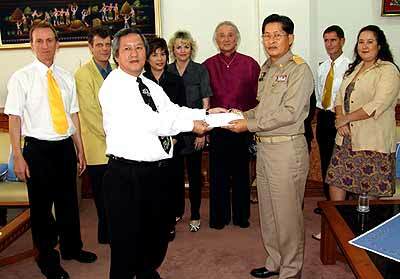 Wachara Tantranont hands over the cheque to Governor Suwat, along with (from left) Marc Waldner, Michael Vogt, Khun Senla, Marion Vogt, Dr. Howard C. Graves Jr., Stephen Yarnold and Pim Kemasingki. The 640,000 baht which was raised during the tsunami charity party at Hillside 4 (Chiangmai Mail Vol. IV issue 4) has been formally handed over to the governor of Chiang Mai. The party, at which over 300 people took part, was a great success, and the target of 400,000 baht was more than easily passed. Governor Suwat praised the effort of all involved. 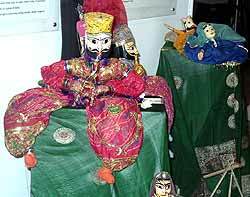 Puppet shows were recently staged by the Center of Arts and Culture Promotions and an exhibition of Southeast Asian Puppetry is on display during January 21 – February 20, 2005 at Chiang Mai University (CMU) Art Museum. The theme is “Puppets Unite” and includes seminars and demonstrations. M.R. Sukhumbhand Paribatra, president of the Chumbhot-Pantip Foundation, tries his hand at making a puppet at the opening of “Puppets Unite”. The main objectives of “Puppets Unite” are to set up an international network for activities in the field of puppetry among puppeteers, artists, academics and students; to give participants greater access to the puppetry of the region; to encourage participants to learn the historical background and to understand and promote the development and the unique charm of puppetry. Part of the Southeast Asian puppet exhibition displayed at the CMU Art Museum until February 20, 2005. The two-day seminar and puppets shows presented puppetry from the six participating countries of Burma, Cambodia, Indonesia, Laos, Vietnam and Thailand. L’Ecole Francaise d’Extreme-Orient (EFEO) or the “French Research School of the Far East” was first established in Saigon/Vietnam in 1898 as the Archaeological Mission in Indochina and received its current name in 1900, when the headquarters were moved to Hanoi. The objective of the EFEO was to engage in archaeological exploration, the collection of manuscripts, and the conservation of monuments, as well as the study of the linguistic heritage of the region, which then formed French Indo-China. At the same time, the EFEO aimed to contribute to the historical study of South Asia, Southeast Asia and Northeast Asia, from India to Japan. 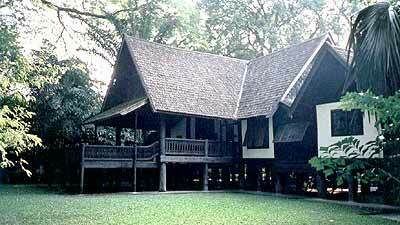 The new “traditional” house on the ground of the EFEO in Chiang Mai. In 1907, and three years after “The Siam Society” in Bangkok was formed, the EFEO was responsible for the conservation of the monumental site of Angkor in Cambodia, one of the largest archaeological sites in the world. As the consequence of the wars and revolution in Indochina, the EFEO headquarters had to be relocated to the French capital Paris in 1960. Since then, the EFEO has opened the following branch offices: Pondicherry and Poona in India (1964), Kyoto/Japan (1968), Chiang Mai/Thailand (1975), Jakarta/Indonesia (1976), Kuala Lumpur/Malaysia (1987), Hong Kong (1989), Phnom Penh (1990) and Siem Reap (1992) in Cambodia, Taipei/Taiwan (1992), Hanoi/Vietnam (1993), Vientiane/Laos (1993), Tokyo/Japan (1994), Seoul/South Korea (1994), Bangkok/Thailand (1997), Beijing/China (1997) and Yangon/Myanmar (2002). The Chiang Mai EFEO Center is at 131 Charoen Prathet Road near Wat Chaimongkhon and was established on the former site of the French Consulate, opposite the Alliance Francaise, which was the French Consul’s residence. The French Consulate in Chiang Mai was closed at the beginning of the Second Word War. Then, in the mid 1970’s, Francois Bizot, a French researcher on Buddhism, who had to leave Cambodia under the Khmer Rouge regime, came to Chiang Mai and built a new “traditional” house on the French ground. He added an office in the early 1990’s. The present supervisor of this remarkable research institution is Dr. Louis Gabaude, who studies the history of Thai Buddhism and the impact that the modernization of Thailand brings along. Hans Mandewirth from the ‘AWO’, a charitable organization in Germany presented 500 Euro (25,000 baht) to Jens Kronberg on behalf of the “Ray of Hope” a German project in Thailand, (founded in 1995 and supported by a small circle of groups and friends from France and Germany). 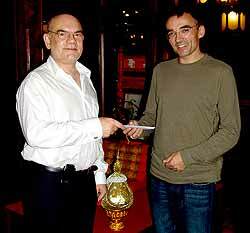 Jens Kronberg (right) receives the donation from Hans Mandewirth. They decided to work in Asia, focusing on Thailand, to help those who cannot help themselves, children and orphans. They set up children homes or support similar existing projects. The 500 Euro was collected by the senior members of the social democrats from Neckarstadt-West and will be used to help the children’s home in Maekachan, currently care of children orphaned by the Tsunami in Phuket.